Natural Cure All status problems are healed upon switching out. This Pokemon's status returns to normal when it leaves battle. flourish in the forests in which it has appeared. to leave behind an egg it brought from the future. appears wherever beautiful forests exist. appears, a bright and shining future awaits us. Emerald This POK�MON came from the future by crossing over time. 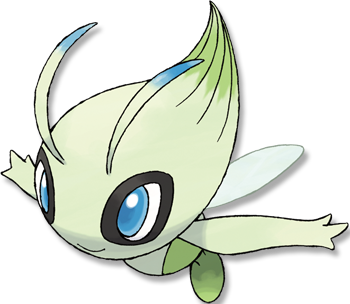 It is thought that so long as CELEBI appears, a bright and shining future awaits us. FireRed When CELEBI disappears deep in a forest, it is said to leave behind an egg it brought from the future. Leaf Green This POK�MON wanders across time. Grass and trees flourish in the forests in which it has appeared. Diamond/Pearl It has the power to travel across time, but it is said to appear only in peaceful times. Platinum It has the power to travel across time, but it is said to appear only in peaceful times. Heart Gold This Pok�mon wanders across time. Grass and trees flourish in the forests in which it has appeared. Soul Silver When CELEBI disappears deep in a forest, it is said to leave behind an egg it brought from the future. Black It has the power to travel across time, but it is said to appear only in peaceful times. White It has the power to travel across time, but it is said to appear only in peaceful times.